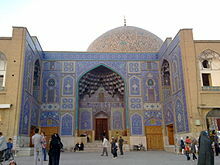 Islamic art comprises both religious and secular art forms. Religious art is represented by calligraphy, architecture and furnishings of religious buildings, such as mosque fittings (e.g., mosque lamps and Girih tiles), woodwork and carpets. 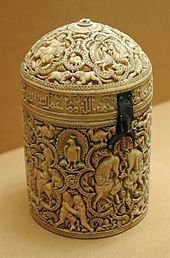 Secular artistic production also flourished in the Islamic world, although some of its elements were criticized by religious scholars. 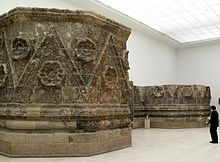 Early development of Islamic art was influenced by Roman art, Early Christian art (particularly Byzantine art), and Sassanian art, with later influences from Central Asian nomadic traditions. Chinese art had a formative influence on Islamic painting, pottery, and textiles. 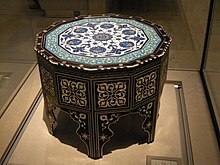 Though the concept of "Islamic art" has been criticised by some modern art historians as an illusory Eurocentric construct,  the similarities between art produced at widely different times and places in the Islamic world, especially in the Islamic Golden Age, have been sufficient to keep the term in wide use by scholars. 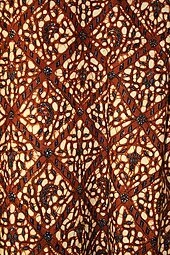 Islamic art is often characterized by recurrent motifs, such as the use of geometrical floral or vegetal designs in a repetition known as the arabesque. The arabesque in Islamic art is often used to symbolize the transcendent, indivisible and infinite nature of God. Mistakes in repetitions may be intentionally introduced as a show of humility by artists who believe only God can produce perfection, although this theory is disputed. Some interpretations of Islam include a ban of depiction of animate beings, also known as aniconism. Islamic aniconism stems in part from the prohibition of idolatry and in part from the belief that creation of living forms is God's prerogative. Muslims have interpreted these prohibitions in different ways in different times and places. Religious Islamic art has been typically characterized by the absence of figures and extensive use of calligraphic, geometric and abstract floral patterns. However, representations of Islamic religious figures are found in some manuscripts from Persianate cultures, including Ottoman Turkey and Mughal India. These pictures were meant to illustrate the story and not to infringe on the Islamic prohibition of idolatry, but many Muslims regard such images as forbidden. In secular art of the Muslim world, representations of human and animal forms historically flourished in nearly all Islamic cultures, although, partly because of opposing religious sentiments, figures in paintings were often stylized, giving rise to a variety of decorative figural designs. Calligraphic design is omnipresent in Islamic art, where, as in Europe in the Middle Ages, religious exhortations, including Qur'anic verses, may be included in secular objects, especially coins, tiles and metalwork, and most painted miniatures include some script, as do many buildings. Use of Islamic calligraphy in architecture extended significantly outside of Islamic territories; one notable example is the use of Chinese calligraphy of Arabic verses from the Qur'an in the Great Mosque of Xi'an. Other inscriptions include verses of poetry, and inscriptions recording ownership or donation. Two of the main scripts involved are the symbolic kufic and naskh scripts, which can be found adorning and enhancing the visual appeal of the walls and domes of buildings, the sides of minbars, and metalwork. Islamic calligraphy in the form of painting or sculptures are sometimes referred to as quranic art. East Persian pottery from the 9th to 11th centuries decorated only with highly stylised inscriptions, called "epigraphic ware", has been described as "probably the most refined and sensitive of all Persian pottery". Large inscriptions made from tiles, sometimes with the letters raised in relief, or the background cut away, are found on the interiors and exteriors of many important buildings. Complex carved calligraphy also decorates buildings. For most of the Islamic period the majority of coins only showed lettering, which are often very elegant despite their small size and nature of production. The tughra or monogram of an Ottoman sultan was used extensively on official documents, with very elaborate decoration for important ones. Other single sheets of calligraphy, designed for albums, might contain short poems, Qur'anic verses, or other texts. The main languages, all using Arabic script, are Arabic, always used for Qur'anic verses, Persian in the Persianate world, especially for poetry, and Turkish, with Urdu appearing in later centuries. Calligraphers usually had a higher status than other artists. Very early Islamic carpets, i.e. those before the 16th century, are extremely rare. More have survived in the West and oriental carpets in Renaissance painting from Europe are a major source of information on them, as they were valuable imports that were painted accurately. 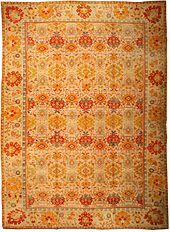 The most natural and easy designs for a carpet weaver to produce consist of straight lines and edges, and the earliest Islamic carpets to survive or be shown in paintings have geometric designs, or centre on very stylized animals, made up in this way. Since the flowing loops and curves of the arabesque are central to Islamic art, the interaction and tension between these two styles was long a major feature of carpet design. Early Islamic columns followed the style seen in the classic period of the Mediterranean. Classic columns can be seen in earlier mosques such as the Great Mosque of Damascus and Córdoba. These columns can vary in form from being completely smooth, and having vertical or twisting fluting. In the 7th and 8th century, the Mosque of the Prophet Medina, was rebuilt using a style known as hypostyle. Hypostyle mosques usually entail multiple columns that support a smooth and even wall. In India, traditionally Indian stone columns of different shapes such a circles, squares and octagons, were incorporated into some mosques. Finally, engaged columns were introduced into decorate Islamic buildings. Islamic art has very notable achievements in ceramics, both in pottery and tiles for walls, which in the absence of wall-paintings were taken to heights unmatched by other cultures. Early pottery is often unglazed, but tin-opacified glazing was one of the earliest new technologies developed by the Islamic potters. The first Islamic opaque glazes can be found as blue-painted ware in Basra, dating to around the 8th century. Another significant contribution was the development of stonepaste ceramics, originating from 9th century Iraq. The first industrial complex for glass and pottery production was built in Raqqa, Syria, in the 8th century. Other centers for innovative pottery in the Islamic world included Fustat (from 975 to 1075), Damascus (from 1100 to around 1600) and Tabriz (from 1470 to 1550). Lusterwares with iridescent colours may have continued pre-Islamic Roman and Byzantine techniques, but were either invented or considerably developed on pottery and glass in Persia and Syria from the 9th century onwards. 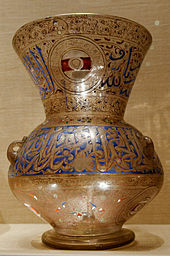 Islamic work includes some three-dimensional animal figures as fountainheads or aquamaniles, but only one significant enamelled object is known, using Byzantine cloisonne techniques. The Pisa Griffin is the largest surviving bronze animal, probably from 11th century Al-Andaluz. More common objects given elaborate decoration include massive low candlesticks and lamp-stands, lantern lights, bowls, dishes, basins, buckets (these probably for the bath), and ewers, as well as caskets, pen-cases and plaques. Ewers and basins were brought for hand-washing before and after each meal, so are often lavishly treated display pieces. A typical 13th century ewer from Khorasan is decorated with foliage, animals and the Signs of the Zodiac in silver and copper, and carries a blessing. Specialized objects include knives, arms and armour (always of huge interest to the elite) and scientific instruments such as astrolabes, as well as jewellery. Decoration is typically densely packed and very often includes arabesques and calligraphy, sometimes naming an owner and giving a date. High levels of achievement were reached in other materials, including hardstone carvings and jewellery, ivory carving, textiles and leatherwork. During the Middle Ages, Islamic work in these fields was highly valued in other parts of the world and often traded outside the Islamic zone. Apart from miniature painting and calligraphy, other arts of the book are decorative illumination, the only type found in Qur'an manuscripts, and Islamic book covers, which are often highly decorative in luxury manuscripts, using either the geometric motifs found in illumination, or sometimes figurative images probably drawn for the craftsmen by miniature painters. Materials include coloured, tooled and stamped leather and lacquer over paint. Religious and civic architecture were developed under the Umayyad dynasty (661–750), when new concepts and new plans were put into practice. The Abbasid dynasty (750 AD – 1258) witnessed the movement of the capital from Damascus to Baghdad, and then from Baghdad to Samarra. The shift to Baghdad influenced politics, culture, and art. Art historian Robert Hillenbrand (1999) likens the movement to the foundation of an "Islamic Rome", because the meeting of Eastern influences from Iranian, Eurasian steppe, Chinese, and Indian sources created a new paradigm for Islamic art. Classical forms inherited from Byzantine Europe and Greco-Roman sources were discarded in favor of those drawn from the new Islamic hub. Even the design of the city of Baghdad placed it in the "navel of the world", as 9th-century historian al-Ya'qubi wrote. The Fatimid dynasty, which reigned in Egypt from 909 and 1171 introduced crafts and knowledge from politically troubled Baghdad to Cairo. By the year 1070, the Seljuks emerged as the dominant political force in the Muslim world after they liberated Baghdad and defeated the Byzantines at Manzikert. 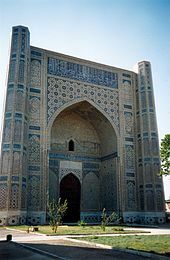 During the rule of Malik Shah the Seljuks excelled in architecture at the same time in Syria, the atabegs (governors of Seljuk princes) assumed power. Quite independent, they capitalized on conflicts with the Frankish crusaders. In 1171, Saladin seized Fatimid Egypt, and installed the transitory Ayyubid dynasty on the throne. This period is notable for innovations in metallurgy and the widespread manufacture of the Damascus steel swords and daggers and the production ceramics, glass and metalwork of a high quality were produced without interruption, and enameled glass became another important craft. Iran and the north of India, the Tahirids, Samanids, Ghaznavids, and Ghurids struggled for power in the 10th century, and art was a vital element of this competition. Great cities were built, such as Nishapur and Ghazni, and the construction of the Great Mosque of Isfahan (which would continue, in fits and starts, over several centuries) was initiated. 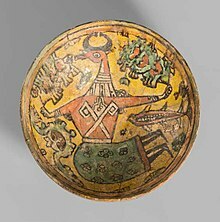 Funerary architecture was also cultivated, while potters developed quite individual styles: kaleidoscopic ornament on a yellow ground; or marbled decorations created by allowing colored glazes to run; or painting with multiple layers of slip under the glaze. The Seljuqs, nomads of Turkic origin from present-day Mongolia, appeared on the stage of Islamic history toward the end of the 10th century. They seized Baghdad in 1048, before dying out in 1194 in Iran, although the production of "Seljuq" works continued through the end of the 12th and beginning of the 13th century under the auspices of smaller, independent sovereigns and patrons. During their time, the center of culture, politics and art production shifted from Damascus and Baghdad to Merv, Nishapur, Rayy, and Isfahan, all in Iran. Innovations in ceramics from this period include the production of minai ware and the manufacture of vessels, not out of clay, but out of a silicon paste ("fritware"), while metalworkers began to encrust bronze with precious metals. Across the Seljuk era, from Iran to Iraq, a unification of book painting can be seen. These paintings have animalistic figures that convey strong symbolic meaning of fidelity, treachery, and courage. A rich civilization developed under these "little khans", who were originally subservient to the Yuan emperor, but rapidly became independent. Architectural activity intensified as the Mongols became sedentary, and retained traces of their nomadic origins, such as the north-south orientation of the buildings. At the same time a process of "iranisation" took place, and construction according to previously established types, such as the "Iranian plan" mosques, was resumed. The art of the Persian book was also born under this dynasty, and was encouraged by aristocratic patronage of large manuscripts such as the Jami' al-tawarikh by Rashid-al-Din Hamadani. New techniques in ceramics appeared, such as the lajvardina (a variation on luster-ware), and Chinese influence is perceptible in all arts. Hillenbrand suggests that the medieval Islamic texts called Maqamat, copied and illustrated by Yahya ibn Mahmud al-Wasiti were some of the earliest "coffee table books". They were among the first texts to hold up a mirror to daily life in Islamic art, portraying humorous stories and showing little to no inheritance of pictorial tradition. Mughal Arabesque inlays at the Agra Fort, India. The Ottoman Empire, whose origins lie in the 14th century, continued in existence until shortly after World War I. This impressive longevity, combined with an immense territory (stretching from Anatolia to Tunisia), led naturally to a vital and distinctive art, including plentiful architecture, mass production of ceramics for both tiles and vessels, most notably Iznik ware, important metalwork and jewellery, Turkish paper marbling Ebru, Turkish carpets as well as tapestries and exceptional Ottoman miniatures and decorative Ottoman illumination. 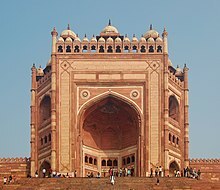 The Mughal Empire in the Indian subcontinent lasted from 1526 until (technically) 1858, although from the late 17th century power flowed away from the emperors to local rulers, and later European powers, above all the British Raj, who were the main power in India by the late 18th century. The period is most notable for luxury arts of the court, and Mughal styles heavily influenced local Hindu and later Sikh rulers as well. 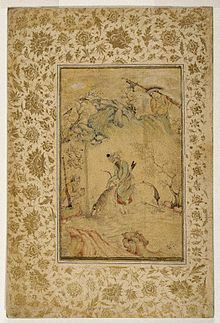 The Mughal miniature began by importing Persian artists, especially a group brought back by Humayun when in exile in Safavid Persia, but soon local artists, many Hindu, were trained in the style. Realistic portraiture, and images of animals and plants, was developed in Mughal art beyond what the Persians had so far achieved, and the size of miniatures increased, sometimes onto canvas. The Mughal court had access to European prints and other art, and these had increasing influence, shown in the gradual introduction of aspects of Western graphical perspective, and a wider range of poses in the human figure. Some Western images were directly copied or borrowed from. As the courts of local Nawabs developed, distinct provincial styles with stronger influence from traditional Indian painting developed in both Muslim and Hindu princely courts. ^ J. M. Bloom; S. S. Blair (2009). Grove Encyclopedia of Islamic Art and Architecture, Vol. II. New York: Oxford University Press. pp. vii. ISBN 978-0-19-530991-1. 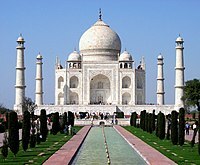 ^ MSN Encarta: Islamic Art and architecture. Archived from the original on 2009-11-01. ^ Melikian, Souren (December 5, 2008). "Qatar's Museum of Islamic Art: Despite flaws, a house of masterpieces". International Herald Tribune. Retrieved September 6, 2011. This is a European construct of the 19th century that gained wide acceptance following a display of Les Arts Musulmans at the old Trocadero palace in Paris during the 1889 Exposition Universelle. The idea of "Islamic art" has even less substance than the notion of "Christian art" from the British Isles to Germany to Russia during the 1000 years separating the reigns of Charlemagne and Queen Victoria might have. ^ Melikian, Souren (April 24, 2004). "Toward a clearer vision of 'Islamic' art". International Herald Tribune. Retrieved September 6, 2011. ^ Blair, Shirley S.; Bloom, Jonathan M. (2003). "The Mirage of Islamic Art: Reflections on the Study of an Unwieldy Field". The Art Bulletin. 85 (1): 152–184. JSTOR 3177331. ^ a b Esposito, John L. (2011). What Everyone Needs to Know about Islam (2nd ed.). Oxford University Press. p. 14-15. ^ a b "Figural Representation in Islamic Art". The Metropolitan Museum of Art. ^ Bondak, Marwa. "Islamic Art History: An Influential Period". Mozaico. Retrieved 26 May 2017. ^ J. Bloom; S. Blair (2009). Grove Encyclopedia of Islamic Art. New York: Oxford University Press, Inc. pp. 192 and 207. ISBN 978-0-19-530991-1. ^ King and Sylvester, 27, 61–62, as "The Medici Mamluk Carpet"
^ a b c d e f Graves, Margaret (2 June 2009). "Columns in Islamic Architecture". Retrieved 2018-11-26. ^ a b c Graves, Margaret. "Arches in Islamic Architecture". Grove Art Online. ^ Savage, 175, suggests that the Persians had made some experiments towards producing it, and the earliest European porcelain, Medici porcelain, was made in the late 16th century, perhaps with a Persian or Levantine assistant on the team. ^ Baer, Eva (1983). Metalwork in Medieval Islamic Art. State University of New York Press. pp. 58, 86, 143, 151, 176, 201, 226, 243, 292, 304. ISBN 0-87395-602-8. ^ Arts, 131, 135. The Introduction (pp. 131–135) is by Ralph Pinder-Wilson, who shared the catalogue entries with Waffiya Essy. ^ Baer, Eva (1983). Metalwork in Medieval Islamic Art. SUNY Press. pp. whole book. ISBN 978-0-87395-602-4. ^ Arts, 201, and earlier pages for animal shapes. ^ See the relevant sections in "Arts"
^ Louvre, Suaire de St-Josse Archived 2011-06-23 at the Wayback Machine. Exhibited as no. 4 in Arts, 74. Ali, Wijdan (2001). 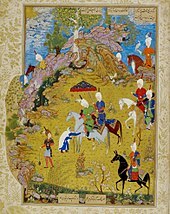 "From the Literal to the Spiritual: The Development of the Prophet Muhammad's Portrayal from 13th Century Ilkhanid Miniatures to 17th Century Ottoman Art" (PDF). EJOS. 4 (7). Archived from the original (PDF) on 2004-12-03. Ettinghausen, Richard; Grabar, Oleg; Jenkins-Madina, Marilyn (2003). Islamic Art and Architecture 650–1250 (2nd ed.). Yale University Press. ISBN 978-0-300-08869-4. Madden, Edward H. (1975). "Some Characteristics of Islamic Art". Journal of Aesthetics and Art Criticism. 33 (4). Mason, Robert B. (1995). "New Looks at Old Pots: Results of Recent Multidisciplinary Studies of Glazed Ceramics from the Islamic World". Muqarnas: Annual on Islamic Art and Architecture. Brill Academic Publishers. XII. ISBN 90-04-10314-7. Carboni, Stefano; Whitehouse, David (2001). Glass of the sultans. New York: The Metropolitan Museum of Art. ISBN 0-87099-986-9. Dodds, J.D. (1992). Al-Andalus: the art of Islamic Spain. New York: The Metropolitan Museum of Art. ISBN 978-0-87099-636-8. Wilkinson, Charles K. (1973). Nishapur: pottery of the early Islamic period. New York: The Metropolitan Museum of Art. ISBN 0-87099-076-4. این صفحه آخرین‌بار در ‏۲۵ مارس ۲۰۱۹ ساعت ‏۰۸:۲۱ ویرایش شده‌است.